Base of Operations: Montezuma Conterminous, Tenochtitlan, circa 1518, but active throughout time and space in the Azure Crosstime Express (ACE). 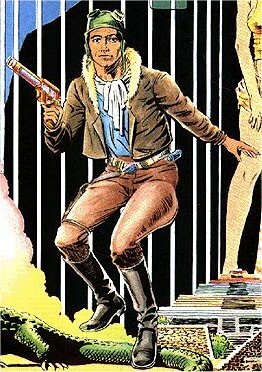 History: A refugee from the 23rd century, Aztec Ace is a dimension-hopping hero trying to save time itself from Nine Crocodile's attempts to disrupt history and generate paradoxes, assisted by his 1940's girlfriend Bridget. Comments: Created by Doug Meonch and Eclipse Comics. Thanks to Loden for much of the above information, and Sathor for corrections.